Thornybush Game Lodge is a five-star African safari lodge which offers luxury accommodation, absolute tranquility and excellent game viewing opportunities. This African safari lodge is the ultimate place to relax and enjoy the wonderful tranquility of the African bush. Browse the library, lounge around by the pool with a delicious cocktail or go on an exciting dawn or dusk game drive in open safari vehicles. Rejuvenate your mind, body and soul at the Thornybush Game Lodge luxurious Amani Spa. Let the expert therapists pamper you in every way possible while staying at this lodge in Mpumalanga. Thornybush Game Lodge is the ideal place for your South Africa romantic honeymoon. What better way to celebrate this intimate and special time in your life than in the complete tranquility, luxury and beauty offered at Thornybush Game Lodge? 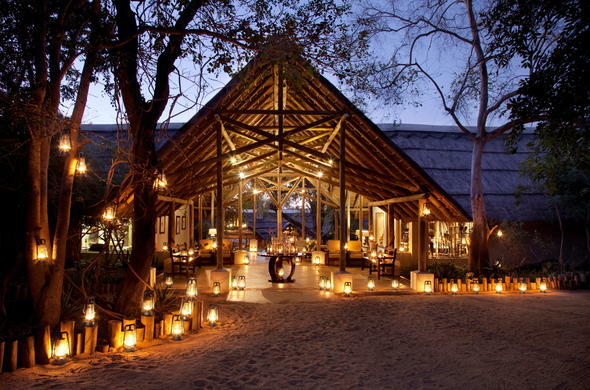 This African safari lodge is also ideal for hosting the perfect safari wedding. The conferencing centre at Thornybush Game Lodge can seat 60 delegates. A wide variety of incentive options are also available to guests. These include tribal dancing, bush dinners, welcome drinks, welcome gifts, welcome notes and banners, pillow gifts and incentive teasers. Children of all ages are welcome at Thornybush Game Lodge. This specialised program for the children are developed to entertain them as they learn about the abundance of fauna and flora. Upon arrival at this luxury safari lodge in South Africa, each child will receive a 'Ranger in Training' pack with goodies and set activities to teach them more about the wild. These activities include game drives and walks specially planned for the children, kiddies meals, picnics, fun at the lodge pool and treasure hunts.